It’s been a while since I last posted… between a trip to the UK (for BSides London) and a few days in bed with con-flu, it’s been a busy few weeks. I’m flying out to South Africa this weekend to take part in the ITWeb Security Summit in Johannesburg. There are a lot of great speakers talking, and I was honoured to be asked to present some of my SAP research as part of the “Enterprise Resource Planning” track. If you’re attending the conference please come up and say hi… I only bite on request! So, back to the interesting idea. A lot of the research I did into the SAP Management Console was about what an attacker could do accessing it from the internet, or directly when on the local LAN segment. Although there’s probably a lot more attackers could do with this stuff, the protections that SAP have rolled out should be enough to deter most casual attackers. I’d also looked at what attackers could do to attack client-side, by sitting in the middle and providing a tainted JAVA applet when an administrator comes to load the SAP Management Console… or even forcing Basic Authentication at points before the application requires it. The thing I’d not really done was think about what an attacker could do from the internet without ever actually having access to the SAP Management Console. Looking back at history a bit, I re-read some posts on using CSRF attacks to change settings on local ADSL routers. The attack isn’t new, and there’s more than a few resources discussing it. However I was interested to see if this sort of attack could be used to perform remote code execution on the SAP Management Console using the OSExecute method. Normally this is an authenticated method, so an attacker would need a username / password, but by using CSRF, this seemed like it could be bypassed if certain conditions were met (i.e. an administrator can be lured to the CSRF page, and they are logged into the SAP MC, or have clicked the “save password” prompt to save time on future logons). The above FORM includes a complete SOAP request (using the OSExecute method) within the first input name field. In the case of the POC script, the servername is set using a variable passed to the page forming the POST message. The name of the SAP system internally can easily be found using one of the SAP Management Console modules that are now in Metasploit. 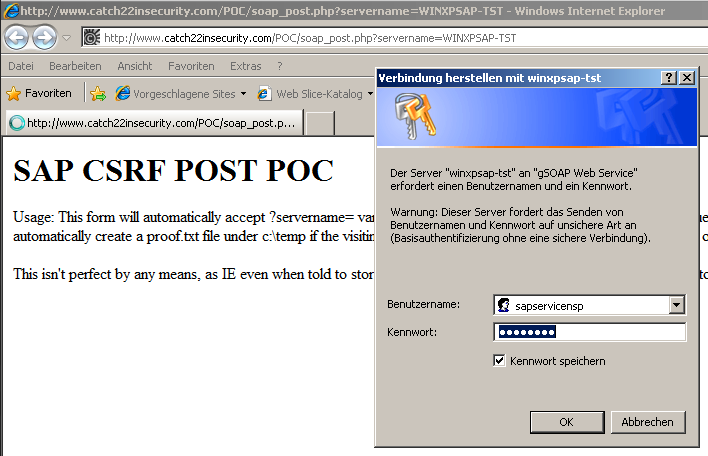 The result is a page that forms a valid POST request to the SAP Management Console inside the targets network. Despite the additional “=” sign being tagged onto the end (as a result of the HTML FORM), the request is valid and will be honored by the SAP Management Console if valid credentials are already saved in the browser being used, or a valid Basic Auth header is present… and THIS is where the “almost was” comes into play. When testing it became evident that browsers (IE and Firefox at the very least) don’t automate the response of valid credentials when they’re stored in the browsers password store. When the SAP Management Console responds to the target asking for credentials, even if they’re stored in the browser, the user is prompted to click OK on the already filled out username/password box. Well that’s a pity! … and no change when serving it up over SSL either. So where does this work? So as to not totally come out of this a looser, where does (or could) this attack work. Sticking with SAP Management Console there are a few places it could still work well. The obvious –> Admins that click-through anything. If the user accepts (or enters) valid credentials, then the OSExecute will be successful. SAP MC Methods that are not protected –> Anything where a blind request can be sent and an action is performed without requesting credentials. This is limited in SAP, and as no response can be received by the attacker, the scope is limited. Attacks against specific SSO implementations –> Not naming names, but there are more than a few Single Sign On solutions out there that take the place of browser passwords stores (and other password stores). These solutions may act differently when saving a password… I’ve seen implementations that fill in the credentials and submit them without user action. Situations where an SAP Administrator has already performed direct actions against the SAP Management Console through the browser, thus setting a valid Basic Auth token –> Few and far between, as the interaction is mostly through MMC of JAVA applets that do not need to use the browser. Exploit delivery –> There are, and will probably be in the future, valid one request exploits against SAP Management Console. This attack vector would allow these exploits to be delivered as long as no credentials or other user input is required. Well there it is… The time invested was minimal and as with everything, you learn as you fail… Feel free to take a look at the POC I put up on my site if you want to try it out for yourself. Please don’t abuse it though! As I said in my previous blogpost, SecZone was a great experience. I took the feedback I got from my Hashdays talk on the same subject and improved on some of the aspects of my talk. Although the changes are minor and no new research content was added, I’ve uploaded the slides to slideshare for those interested. Thanks to the #DirtySec crew for the feedback! Always room for improvement! As usual if you have any feedback or questions… please get in touch!